Established in 2001, CHINUP specializes in manufacturing of die cutting machine for Electro-Optical Industry. We aim to offer the best optical film cutting solution, and establish the leading position in the supply chain of Electro-Optical Industry. We depend on our professional skill, innovation and integrity to grow up with our clients. After strict testing and identification from variety of companies and engineers, CHINUP already built high quality reputation in the scope of optical film cutting machine. 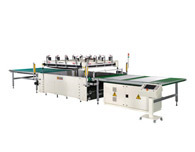 Every die Cutting machine, Guillotine machine, slitting machine, tape machine are made from CHINUP in Taiwan, and we always keep good communication with our customers and exchange the experience of productivity to make our machine better. NEPCON South China is one of the biggest product and technology procurement platforms for the electronics manufacturing industry in South China. Boasting the longest standing history, it gathers 33,000 high-end buyers, decision makers, engineers, and technicians from EMS/OEM/ODM, including consumer electronics, communications, and the computer, automotive and medical electronics sectors.